Munich Re is targeting a rise in year on year profit of €200 million (US$227 million) to around €2.5 billion (US$2.84 billion) for 2019’s financial year. Around €2.1 billion will be attributable to reinsurance and around €400 million to its insurer Ergo. 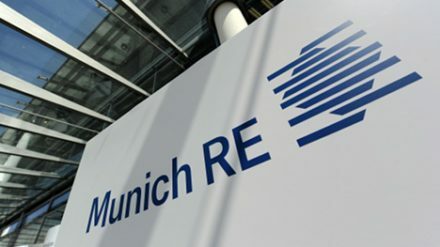 The target comes after Munich Re’s profits rebounded dramatically in 2018 to €2.28 billion after a slump in 2017 to €392 million. Following positive developments in the past year, the expected technical result for life and health reinsurance has been raised to around €500 million. In P&C reinsurance, Munich Re is aiming for an improved combined ratio of around 98% this year, while in Ergo’s international segment, which includes Asia, the combined ratio will be around 95%. The German giant is expecting an investment result of around €6.5 billion for 2019, representing a return on investments of about 3%. Assuming exchange rates remain stable, Munich Re anticipates gross written premiums of around €49 billion this year, comprising of around €31 billion GWP in reinsurance and approximately €17.5 billion GWP for Ergo.